And kudos to you retail people for putting up with it, and of course I'm not talking about the serious stories out there, like people fighting over freakin' XBOX ONEs and other meaningless crap. I'm talking about the completely inexplicable. The stories, which can't be explained. Look, I love horror, but not for the genuinely horrific, the kind of stuff that makes you almost sad for this world (although reading or watching those types of stories can help you appreciate the good in the world). So when it comes to Black Friday, I have to just be mesmerized by the stories that make me turn my head in awe.... As in, why? It's almost shocking! Tickle Me Elmo -- The doll was insane when it came out in stores, but honestly.... You'd have to see the craziness from the eyes of a cashier. Let's just put it that way. Those Long Black Friday Lines -- People are crazy. Seriously. They're so crazy that even this will happen. True story. Newspaper Carriers -- Here's why the Black Friday newspapers in the country are the most popular. 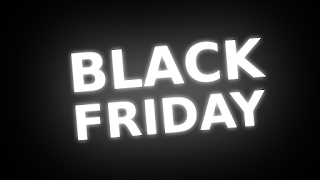 Like watching THE CRAZIES and plenty of stalker films when you think about it.... Black Friday's some crazy stuff!